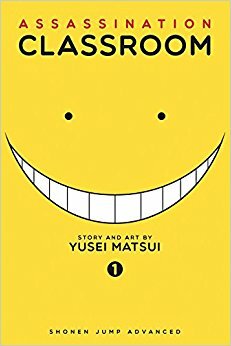 I have a general rule that I like to read stories before I watch their adaptation, but I had already seen the Assassination Classroom anime when I started the manga. This means that my impression of the first volume is somewhat altered by the fact that I already know what’s going to happen later. This potentially means that I liked it more than I would have if I was reading it with no foreknowledge. I just thought it was worth pointing it out before I started. Anyway, the premise of Assassination Classroom is an unusual one. 70% of the moon has been destroyed and a strange, tentacled creature with a large yellow smiley face for a head has claimed responsibility, threatening to do the same to the earth in a year’s time. This creature can move at mach 20 speeds and is incredibly powerful – the world’s armies can do nothing to harm him. He then asks that he be allowed to teach a class of under achieving children in return for allowing them to try and kill him (and therefore save the Earth.) I’m sure it must sound rather weird, maybe too much so for some people, but I definitely recommend that you give it a try and stick with it. The story is mainly told from the point of view of Nagisa, a student in Class 3-E, which is the class that the creature has asked to teach. As the creature does not have a name, they end of nicknaming him Koro Sensei (a play on the word “korosenai” which means immortal) and they find that he actually seems to care about them and their education a lot more than any of the teachers they’ve had in the past. We get a lot of Nagisa’s inner conflict and confusion about this. This first volume does a good job of setting the scene and my favourite thing about it is definitely Koro Sensei. One minute he seems like he’s evil and insane, the next he’s deeply concerned about the wellbeing of his class. You’ll be wondering what his motivations may be and how much he can be trusted. But even if you think he is pure evil, you’ll still find him very loveable. We get a few little hints at his background too. He’s charismatic and enigmatic, which is a great combination. Nagisa himself (the main character of the story) is also quite a likeable and relatable character. He’s an outcast kid at his school and he’s generally just a nice, regular person who you want things to go well for. Karma is another particularly good character who comes into it a little later on – he’s a student who’s absent at first due to a suspension and seems at least a little psychotic. The story ends with on a nice little cliffhanger which should leave you keen to find out what happens in the next volume. It will also leave you asking questions. Will the world really be destroyed? Will they really kill this jovial being? Or will something else happen? You’ll have to keep reading to find out and I definitely recommend that you do. Volume 1 is a great introduction.